Background: Axel Howerton was one of the creators of the Coffin Hop, so this one in my series of appreciation posts belongs to him. Axel hails from Canada, has done work on Dark Moon Digest, and is working on his second novel. Check out his website here. What it’s about: The short story begins rather mysteriously: a cowboy stumbles into a diner in Las Vegas, covered in blood, and the story unfolds for not only the patrons at the diner but also for the readers as he begins to tell his tale. Apparently, shenanigans have been going on at the magic show with Siegfried and Roy, and the cowboy reveals that a vicious white tiger has broken loose from the show. Horrified, the diner customers barricade themselves inside, but of course there is much more to the story. As it turns out, the tiger is the least of their problems because people have been turning into zombies at Siegfried and Roy! Why it will keep you up at night: Howerton maintains a tongue-in-cheek humor about the whole affair as the story gets progressively bloodier and zanier. The story is a horror-comedy, to be sure, so don’t be looking out for utter creepiness that will haunt your dreams. Instead, enjoy the interesting characters, the crazy story that Howerton has cooked up, and the possibility of zombies popping out where you least expect them. 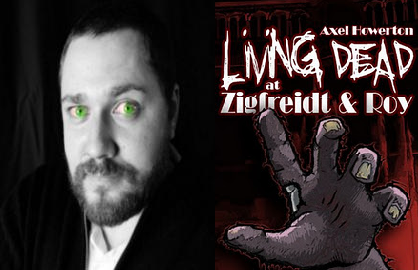 Read Living Dead at Zigfreidt & Roy – A Vegas Zombiepocalypse now! Let’s hear it for the Howerton shout-out!! Thanks for highlighting Axel’s work, Joanna. I usually lean toward vampires and ghost stories, but this tale sounds quite interesting.